Influencer marketing has been the go-to strategy in digital marketing for a couple of years now. Ever since marketers discover the power of social media influencers marketing we’ve seen a growing number of cooperations between brands and Internet celebrities. And rightly so! Customers tend to rely on recommendations of people they trust. That’s why social media influencer marketing is so effective. 38% of respondents who engage with influencers trust what an influencer says about the brand more than what the brand says itself. Having a bulletproof influencer marketing strategy is a must-have, not only of this season but of many to come. 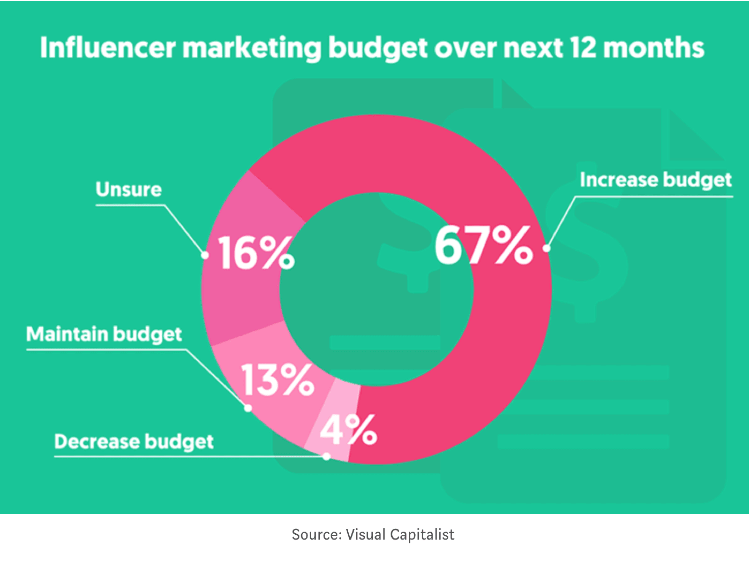 67% of marketers intend to increase their influencer marketing budget for the next year. The numbers will rise in the future. Many experts anticipate that the influencer market will be worth about $5 – 10 billion by 2020. There are, however, companies who still don’t have a firm grasp on their influencer strategy. It’s a shame because influencer marketing campaigns can benefit your company enormously. By implementing influencer marketing campaigns you can drive traffic to your website, generate leads, raise brand awareness and much more. How to Build an Influencer Marketing Strategy? Influencer marketing strategy is one of those scary terms that seem quite overwhelming, especially if it’s your first campaign. You have to choose the right influencer to work with, develop a campaign, know how to measure the results of a campaign and draw conclusions after the influencer campaign has ended. That’s a lot, especially for an uncharted territory that is influencer marketing. To makes things a bit easier for you we gather seven best practices for influencer marketing! The first influencer marketing how-to is the creation of viral content. But what makes a piece of content go viral? Jonah Berger and Katherine Milkman analysed over 7 000 articles from the New York Times. They wanted to know what makes the audience share the stories. It turns out the key is to induce positive emotions. Focus on how your product or service can make the lives of your customers more comfortable. Showing the added value can tip the clients to your side. Speak to your potential customers about the real-life benefits of your product or service. Show how exactly your product is helping in everyday situations. No one wants to hear some technical mumbo-jumbo any more. Instead, concentrate on practical applications. I can give you a real-life example. I was recently looking for new hiking shoes. There were a few features I needed – they have to be waterproof, but also breathable and light. The problem was that the manufacturers talk about the membranes and technology using many different weird abbreviations. I don’t have time to check what they mean. An excellent idea for an influencer marketing campaign would be giving away a pair of shoes and letting the influencer describe their experience. 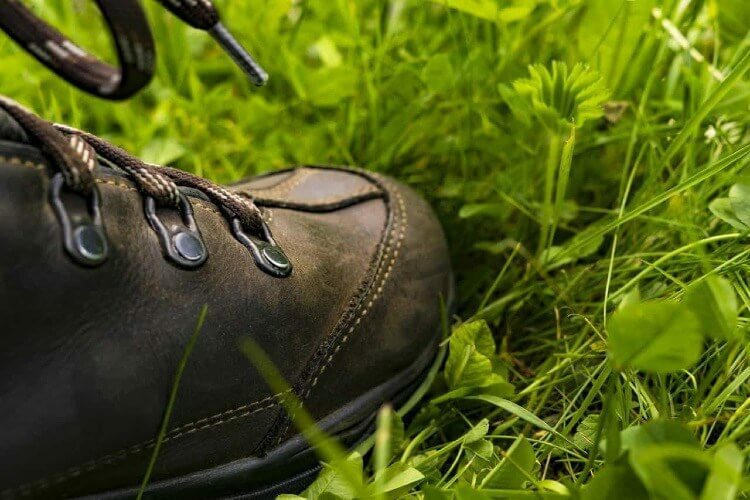 I would be inclined to buy shoes if I knew that Meindl Flex System means my feet won’t get wet while hiking! I cannot stress it enough. Choosing the right influencers is the key to success. Probably all of the marketing managers dream of cooperating with Internet celebrities who have vast numbers of followers. Surprisingly, that might not be the best marketing strategy. Look for micro-influencers – people who have a smaller number of followers, usually up to 100 000 people. Their posts, however, generate much higher engagement rates than posts by macro-influencers. Your customers relate more to micro-influencers as they are much more trustworthy than people with massive followings. That all might seem obvious, but I still see many campaigns where influencer is not a good fit. When a blogger usually posts about high-end hi-fi systems, and suddenly starts writing about fashion, then there’s something not right. How do you choose the right influencer for your marketing campaign? 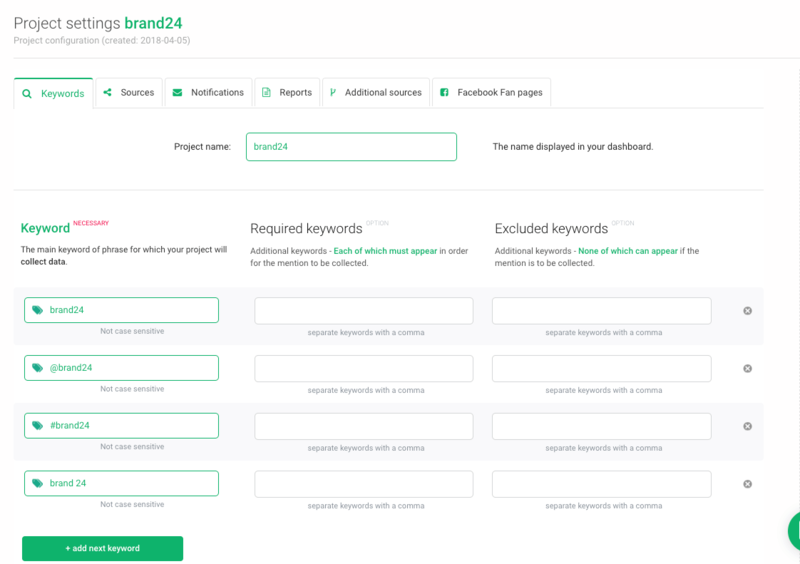 An Internet monitoring tool, like Brand24, is an answer. You will find the right influencer in just a few easy steps. First, you have to set up a project. 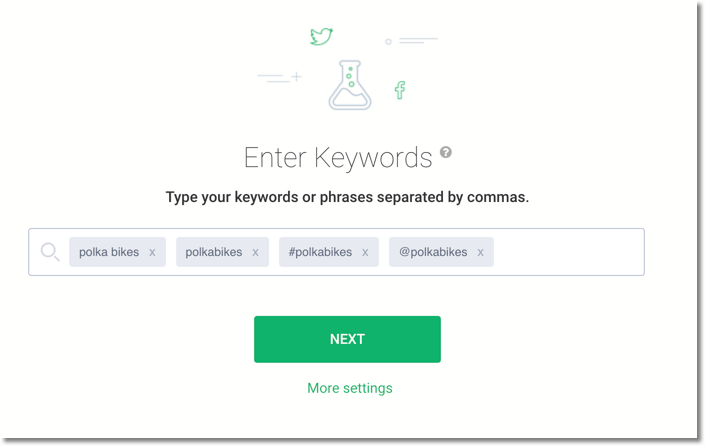 All you have to do is choose the right keywords, and the tool will start collecting publicly available mentions from the internet. Keyword specific to your industry. The last one is a bit tricky. You need to monitor what’s going on in your industry so you can find new potential influencers to work with. But if your keywords are too broad, you will get a lot of notifications that are of no use to you. Imagine you run a restaurant or a wedding salon. Keywords like “restaurant” or “wedding salon” are too general to provide useful results. You will receive all the mentions containing these terms. So, how can you narrow down the search but still get relevant results? The filters come to the rescue! 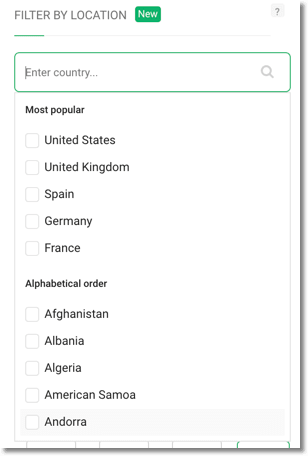 If you want to monitor mentions from a specific country, you should try the Locations filter. You will see only results from one particular state. Combine it with a specific keyword from your industry, and you will have a general idea on how the wind blows. Another option for narrowing down your results is to implement a Boolean search. To keep things short – you can combine your formulas with operators like “and”; “not”; “or”. Your search results will be tailored to your needs. When you have your project all set up, it’s time to find out who your future Instagram or Twitter influencer marketing star is! First, determine the period which you want to analyse. You can set up your parameters to whatever suits you best. I choose the last 30 days. Then go to the analysis tab. Pick “The most popular authors”. Those are the users who already know your product and spread the word around about it. Your best influencers are probably already in your network. On the right side of the screen, you see a “Filter mentions” tab. You can select the social media channel you’re most interested in. Marketing strategy for Facebook will be different than the plan developed for Instagram, but with Brand24 you can identify the right influencers for every platform. Brand24 offers 14-day free trial, no credit card required! Everyone likes to feel unique and appreciated. That’s why you should reward influencers with whom you already work. It’s easier than it sounds! 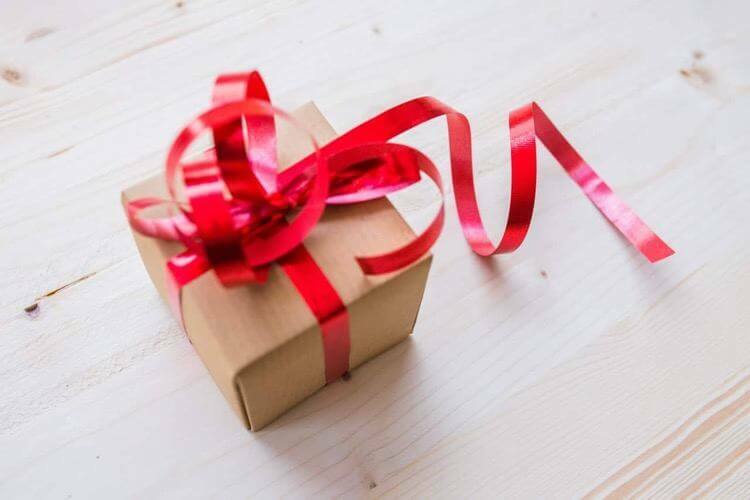 Think about sneak peek of your newest product or service, exclusive content developed especially for influencers, a free demo of your product or service or personalised gift. That will make the influencers you work with feel appreciated and aware of your newest merchandise. Moreover, you can ask your influencers for feedback. That way, before you release a new product, you will be able to make it even better. There are two types of marketing metrics that are super important – paid and organic traffic. 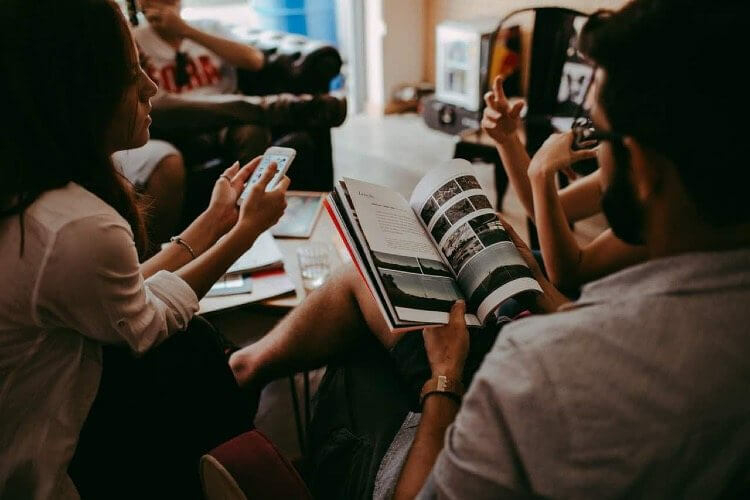 You can cooperate with influencers on a business level, but you can also become one of the interlocutors during the influencer marketing campaign. The point is to develop a reputation in your industry. Produce valuable content for your blog or execute an Instagram influencer campaign that will get the industry talking. Share your opinion on topics trending in your industry. Develop a personality for your brand. Take a look at Wendy’s, an American fast food restaurant chain. Wendy’s is well known for its unconventional approach to the customer experience on Twitter. That’s a very risky strategy so I won’t recommend it. But a well thought out brand personality will help you get some organic traction with influencers. The point is to become a sort of influencer on your own. By cooperating with other famous people, you will create a kind of influencer marketing hub. 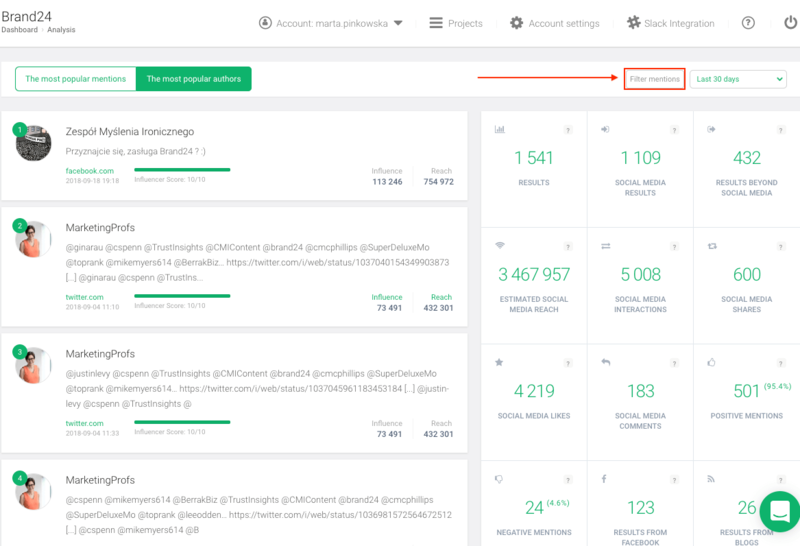 Moreover, monitor the conversations around the influencer marketing campaigns and jump in whenever you see fit. Your potential customers may have some additional questions influencer can’t answer. That’s your spot to shine. Depending on the premises of the campaign, you might get a lot of user-generated content to share on other social media platforms. That’s basically a self-running marketing campaign! You have to remember about the cons of influencer marketing campaign. You’re giving away some of the power over your brand. The worst thing that could happen is getting involved is a mess made by influencers. That’s why you need to stay on the top of things all the time. What you can find useful is Slack integration and Storm Alerts. 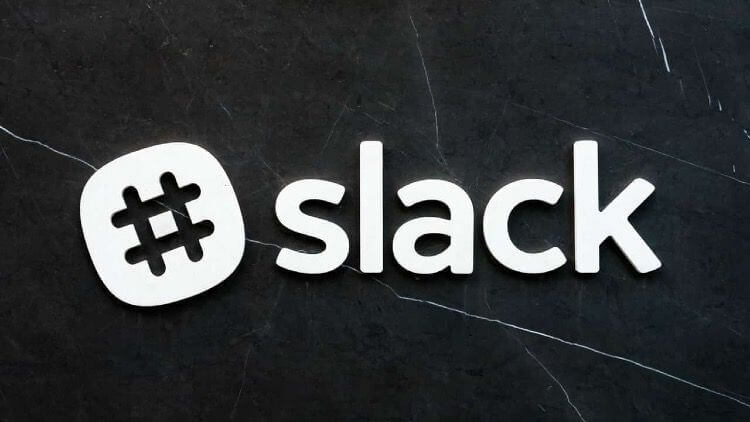 You can integrate your Brand24 account with Slack and receive instant notifications every time there’s new mention in your project. You can address any queries almost instantly. Storm Alerts are emails you will get when there’s an unusual increase in the number of mentions. You will stay in the loop and be able to react in time to prevent a quickly escalating crisis. This one is my pet peeve. There are times when suddenly many bloggers recommend the same book or watch, or suncream. And you can’t find a single mention about sponsored content anywhere. There’s nothing wrong with paid ads, whether its native Facebook or Instagram campaign or an influencer campaign. Just be honest about it. Your audience will appreciate it. The content should defend itself, no matter whether there are financial strings attached or not. A great example of honesty is micro – influencer Father of Daughters. He has four daughters and describes his daily challenges of being outnumbered on his Instagram account. Besides funny stories, Simon sometimes posts a sponsored content. All of it is clearly marked as an ad. This point also proves how important it is to choose the right influencer to work with. Some people cooperated with so many brands that they are completely untrustworthy in the eyes of customers. Just like with any other marketing activity you need to measure the results of your campaigns. Set the goals before the campaign starts, so you know whether it was worth the effort. Don’t get caught up in vanity metrics like the number of impressions or registered users. You can count the social media reach in hundreds of thousands, but that doesn’t mean the campaign was successful. What is the ultimate goal of your influencer campaign? Raise awareness of your brand? Change how people see your company? Or drive sales? Identify the metrics that are key to your business and check if the campaign brought desirable results. 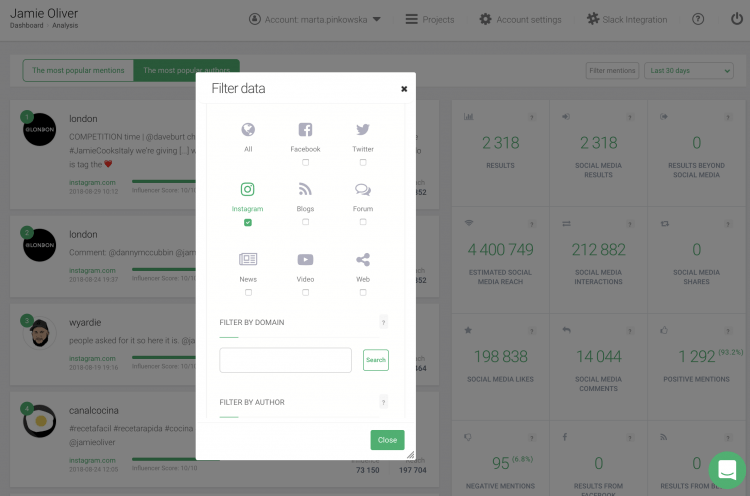 Many different tools can help you measure the effects of a campaign, like BuzzSumo or Sprout Social. 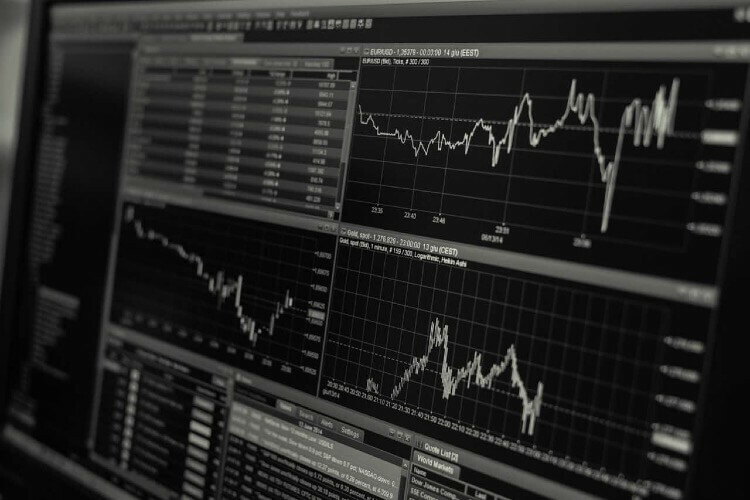 But before you invest in a SaaS tool, take a look at Google Analytics. 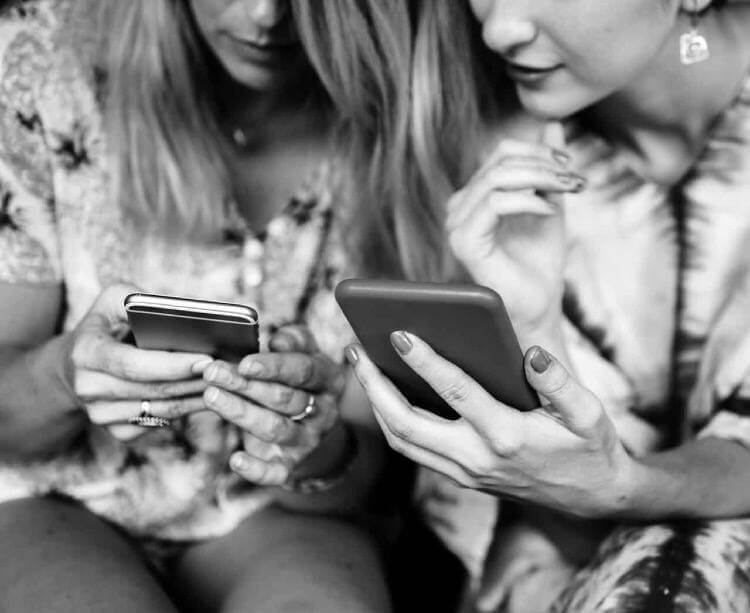 With GA you can check the demographics to determine whether your campaign is reaching the right audience or identify the influencers and social media channels that are generating the most leads. If your goal is to drive sales, then providing UTM parameters is one of the most straightforward solutions. 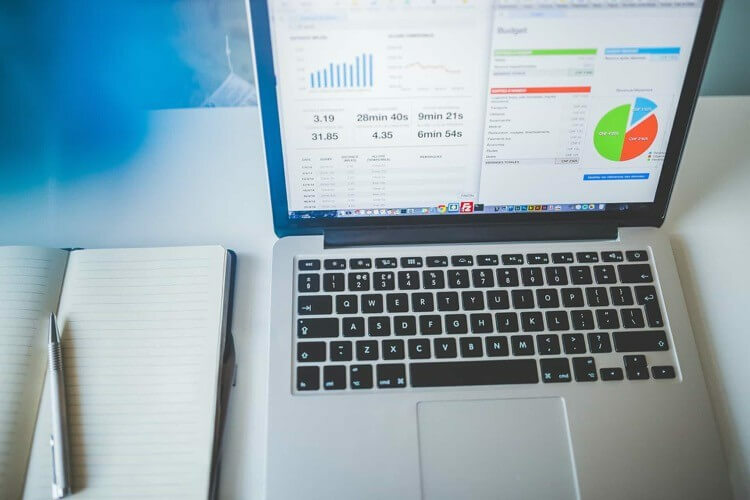 Google Analytics will collect the information on which links precisely your visitors clicked to get to your website and present them in a report. Yes, I know the title says seven best practices for influencer marketing. And, yes I know how to do math (although, resitting my statistics exam is one of my haunting nightmares). But here are two extra best practices that will make your life so much easier! Get creative when choosing the right people to work with. The easy way to promote your product is to cooperate with people who have expertise in the same niche. 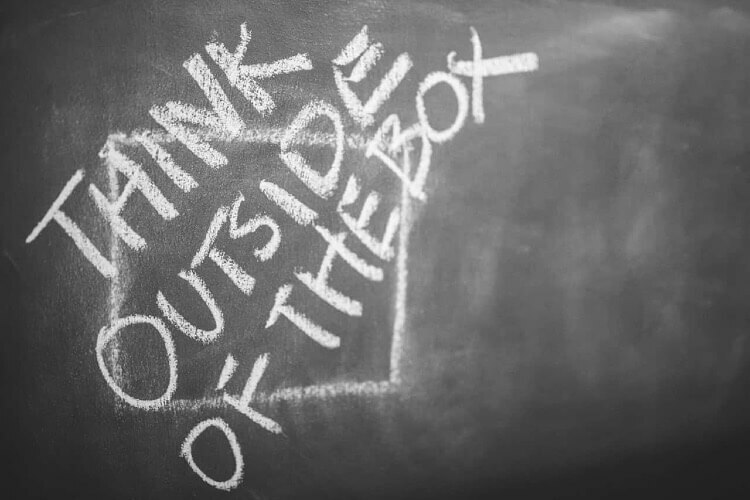 One of the benefits of influencer marketing is that you get to think outside of the box and get in touch with someone who is not clearly associated with your business. A food blogger can advertise jewellery, someone who is popularising science can post about cosmetics, and interior designer probably has something to say about photography. The point is to look for overlaps. This will allow you to reach a new audience and successfully promote your product or service on many different platforms. Influencer marketing can give your company a massive boost when it comes to many different KPI. If executed well, it will increase your brand awareness, generate leads and, ultimately, provide new clients. In a couple of years, your brand will be lost without sound influencer marketing strategy. So to keep things simple, yes, influencer marketing is definitely worth the effort. Have you tried influencer marketing strategy? What would you add to the list? I’d love to hear your thoughts!